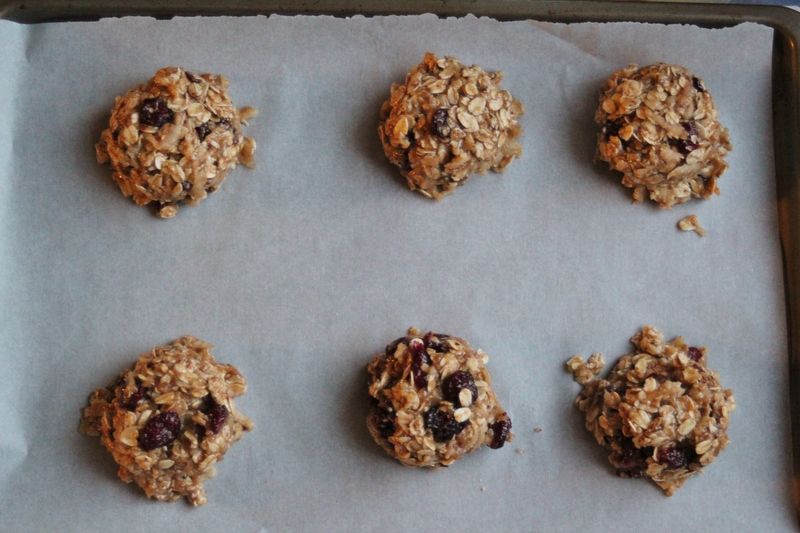 Apple Lemon Cranberry Oatmeal Cookies – recipes from the birdcage. My child has started multiplication and I do NOT know how to help her. I need to clarify, of course, that I know how to multiply I just don’t know how to explain the process. I suppose it’s due to my being out of elementary school for so long that mathematical basics are second nature to me? I dunno. I can’t be the only parent out there that struggles with homework, right? And I certainly can’t be the only parent that struggles with keeping the other, younger sibling occupied while the eldest one whines, squirms, and cries in frustration, right? Miss B likes to antagonize her sister. She likes to talk, point, punch, poke, and generally annoy Miss M – and her momma – in the process. The youngest of my daughters does not understand the concept of homework yet. But just wait until the fall when Kindergarten starts. Ruuuuude awakening in store for my kiddo. The one thing I know of that keeps my youngest sane and occupied is helping in the kitchen. (See my post for Double Chocolate Caramel Pretzel Cookies for evidence) Oh, and TV time but I generally try to limit that as much as possible. I can only hear the Sofia the First theme song so many times. Most importantly, the one thing that keeps ME sane during the homework process is baking. 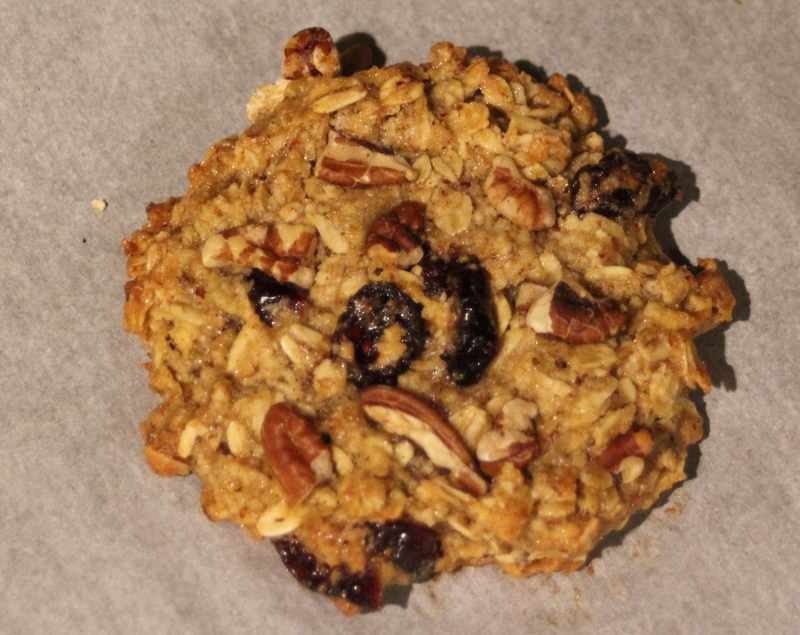 Last night – while Miss M toiled away on multiplication – Miss B and I whipped up a batch of huge Oatmeal Cookies. While I can’t explain to an 8-year-old how to do multiplication, I can explain how to make some awesome cookies. They are gluten free, vegan, and huge. Let’s not fool ourselves into believing that we stop at one cookie normally, so I’m going to cut to the chase and just show you how to make a big ‘un. Wanting something different than a standard oatmeal cookie, I used Texas Olive Ranch Meyer Lemon Olive Oil, shredded apple, cranberries, brown sugar, and a hefty dose of cinnamon. I was inspired by an apple pie I make, which shares the same flavors. I use “flax eggs” in lots of items around here, given that I flirt on and off with veganism. My standard recipe for a flax egg is 1 T. ground flax to 2 T. water and let it sit about ten minutes until it resembles cold cream of wheat in texture. This recipe calls for 1/4 cup mashed banana. 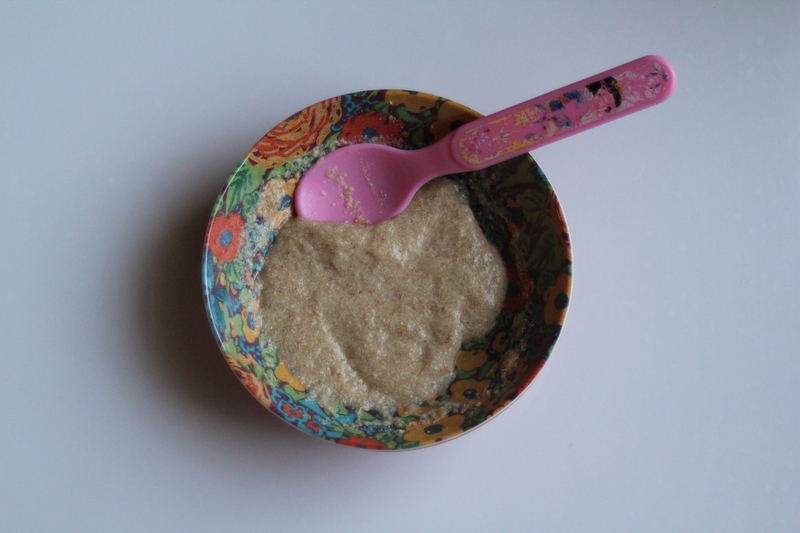 If you have 1/4 cup unsweetened applesauce feel free to use that. 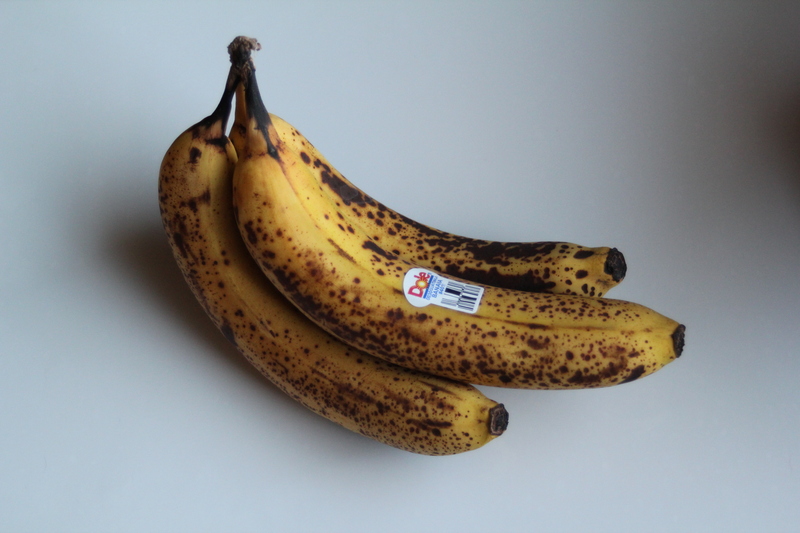 I just had a plethora of – gag – overripe bananas on hand. Using a Tablespoon, scoop out about 2 T. worth of dough and plop that heap onto a parchment lined baking sheet. Give them a ‘lil pat on the head to flatten them to about 1/4 inch in thickness. 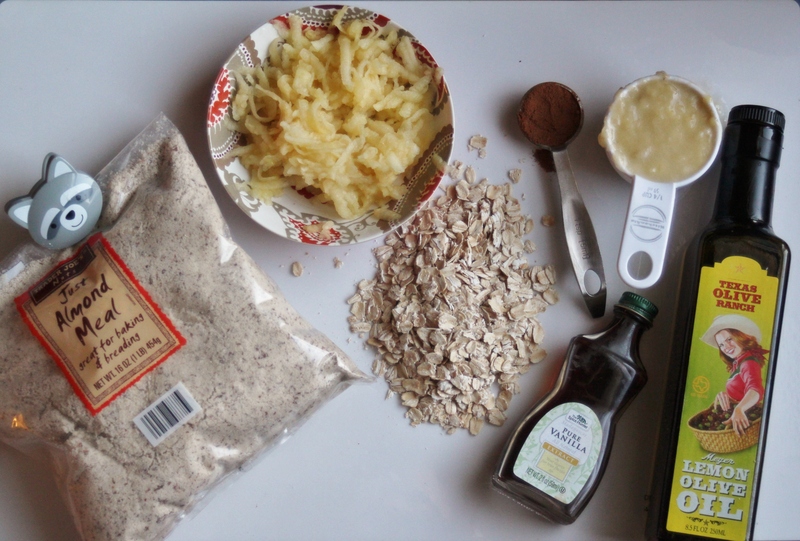 In this recipe, feel free to use either Quick Oats or Old Fashioned Oats. I prefer an “oaty” cookie, so I used Old Fashioned. 1/4 cup olive oil (I used Texas Olive Ranch Meyer Lemon Olive Oil) *If you use regular olive oil, simply add 1 tsp. grated lemon zest. 2. In a small bowl, mix together 1 T. ground flaxseed and 2 T. water. Allow to sit undisturbed for ten minutes. 3. In a large bowl, whisk together the grated apple, flax mixture, mashed banana, olive oil (and lemon zest if using plain olive oil), and vanilla extract. 4. 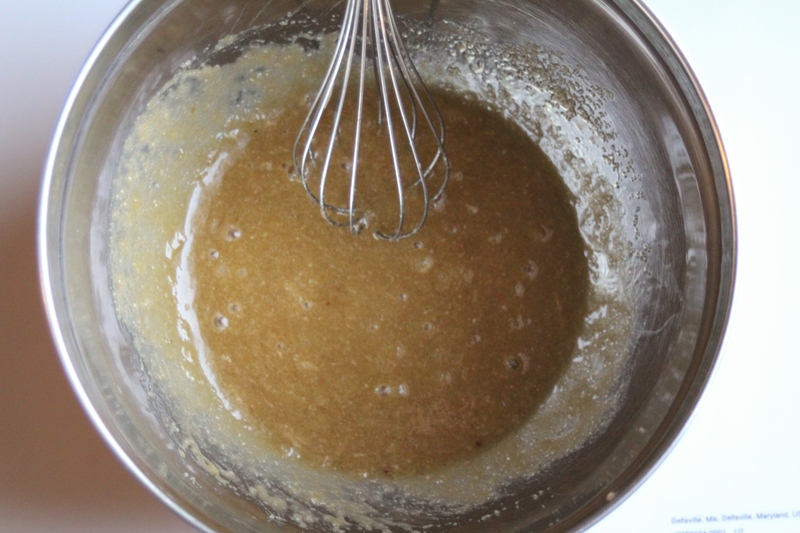 Add in baking soda, salt, cinnamon, and almond meal and use a spatula or wooden spoon to combine with wet ingredients. 5. 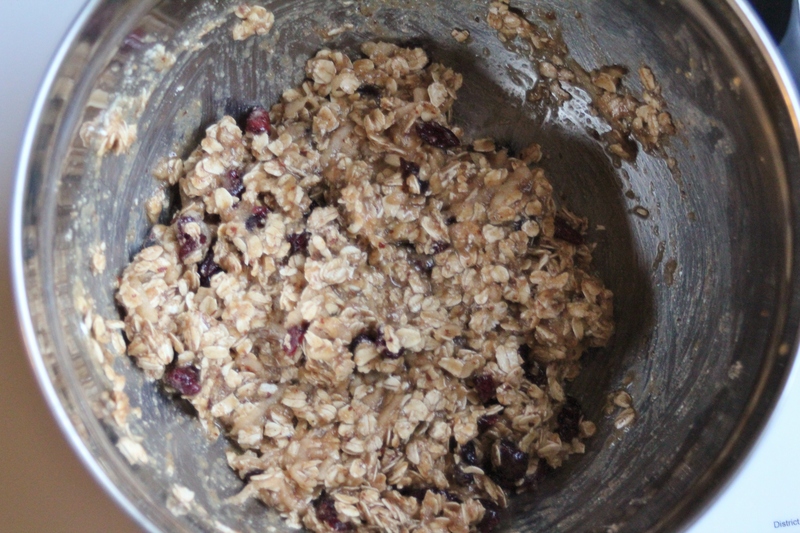 Add in oats, dried cranberries, and nuts (if using). 6. 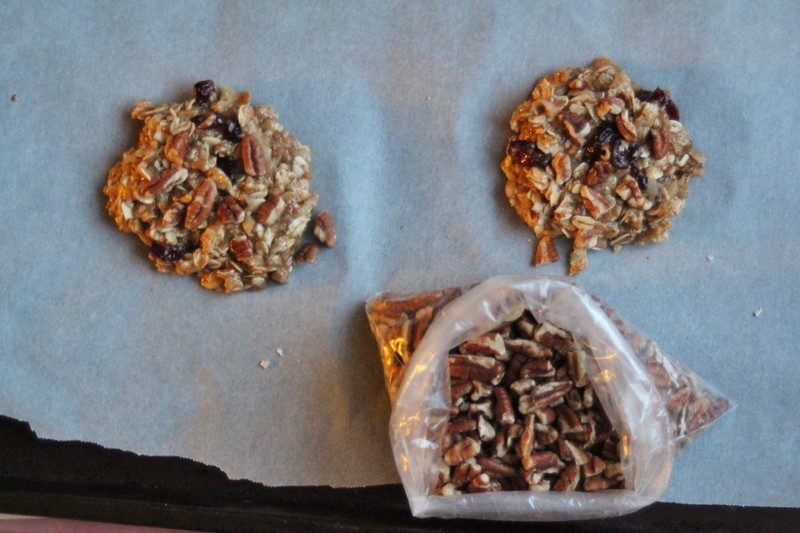 Place 2 T. of dough onto parchment paper-lined baking sheet. 6 cookies per batch is ideal. Use hand or bottom of glass to flatten cookie to 1/4 inch thickness. 7. Bake at 350 for about 13 – 15 minutes or until browned at edges. 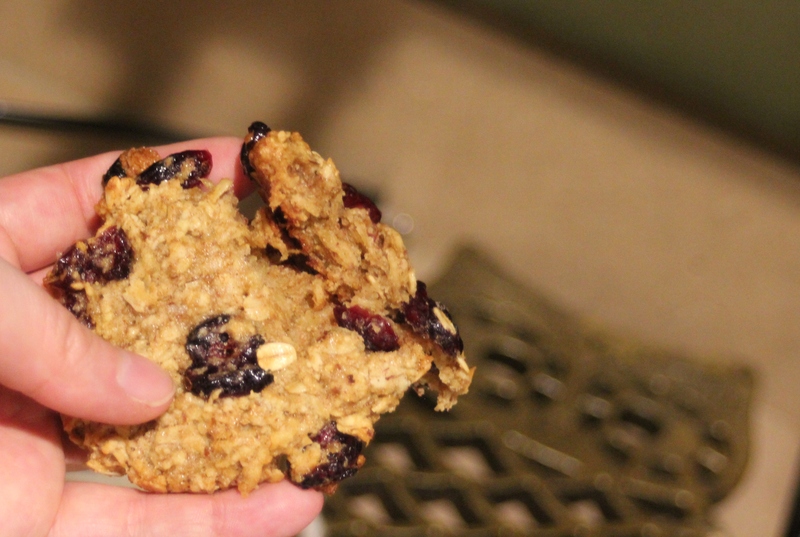 The lemon flavor is strongest right out of the oven and makes for an interesting and unusual oatmeal cookie; the citrus plays of the tang of the dried cranberries quite nicely. Once the cookies are cool the flavors all marry and are lovely. I highly recommend a hot cup of Earl Grey or Sweet Tea with these!